RIEL: Your Honours, gentlemen of the jury: It would be easy for me today to play insanity, because the circumstances are such as to excite any man, and under the natural excitement of what is taking place today (I cannot speak English very well, but am trying to do so, because most of those here speak English), under the excitement which my trial causes me would justify me not to appear as usual, but with my mind out of its ordinary condition. I hope with the help of God I will maintain calmness and decorum as suits this honourable court, this honourable jury. You have seen by the papers in the hands of the Crown that I am naturally inclined to think of God at the beginning of my actions. I wish if you - I-do it you won't take it as a mark of insanity, that you won't take it as part of a play of insanity. Oh, my God, help me through Thy grace and the divine influence of Jesus Christ. Oh, my God, bless me, bless this honourable court, bless this honourable jury, bless my good lawyers who have come 700 leagues to try to save my life, bless also the lawyers for the Crown, because they have done, I am sure, what they thought their duty. They have shown me fairness which at first I did not expect from them. Oh, my God, bless all those who are around me through the grace and influence of Jesus Christ our Saviour, change the curiosity of those who are paying attention to me, change that curiosity into sympathy with me. The day of my birth I was helpless and my mother took care of me although she was not able to do it alone, there was some one to help her to take care of me and I lived. Today, although a man I am as helpless before this court, in the Dominion of Canada and in this world, as I was helpless on the knees of my mother the day of my birth. The North West is also my mother, it is my mother country and although my mother country is sick and confined in a certain way, there are some from Lower Canada who came to help her to take care of me during her sickness and I am sure that my mother country will not kill me more than my mother did forty years ago when I came into the world, because a mother is always a mother, and even if I have my faults if she can see I am true she will be full of love for me. When I came into the North West in July, the first of July 1884, I found the Indians suffering. I found the half-breeds eating the rotten pork of the Hudson Bay Company and getting sick and weak every day. Although a half breed, and having no pretension to help the whites, I also paid attention to them. I saw they were deprived of responsible government, I saw that they were deprived of their public liberties. I remembered that half-breed meant white and Indian, and while I paid attention to the suffering Indians and the half-breeds I remembered that the greatest part of my heart and blood was white and I have directed my attention to help the Indians, to help the half-breeds and to help the whites to the best of my ability. We have made petitions, I have made petitions with others to the Canadian Government asking to relieve the condition of this country. We have taken time; we have tried to unite all classes, even if I may speak, all parties. Those who have been in close communication with me know I have suffered, that I have waited for months to bring some of the people of the Saskatchewan to an understanding of certain important points in our petition to the Canadian Government and I have done my duty. I believe I have done my duty. It has been said in this box that I have been egotistic. Perhaps I am egotistic. A man cannot be individuality without paying attention to himself. He cannot generalize himself, though he may be general. I have done all I could to make good petitions with others, and we have sent them to the Canadian Government, and when the Canadian Government did answer, through the Under Secretary of State, to the secretary of the joint committee of the Saskatchewan, then I began to speak of myself, not before; so my particular interests passed after the public interests. A good deal has been said about the settlement and division of lands a good deal has been said about that. I do not think my dignity to-day here would allow me to mention the foreign policy, but if I was to explain to you or if I had been allowed to make the questions to witnesses, those questions would have appeared in an altogether different light before the court and jury. I do not say that my lawyers did not put the right questions. The observations I had the honour to make to the court the day before yesterday were good, they were absent of the situation, they did not know all the small circumstances as I did. I could mention a point, but that point was leading to so many that I could not have been all the time suggesting. By it I don't wish it understood that I do not appreciate the good works of my lawyers, but if I were to go into all the details of what has taken place, I think I could safely show you that what Captain Young said that I am aiming all the time at practical results was true, and I could have proved it. During my life I have aimed at practical results. I have writings, and after my death I hope that my spirit will bring practical results. The learned lawyers for the Crown have produced all the papers and scribbling that was under their hands. I thank them for not having brought out those papers which are so particular to myself, though as soon as they saw what they were they should not have looked at them. I have written not books but many things. All my papers were taken. I destined the papers to be published, if they were worth publishing, after my death. I told Parenteau, one of the prisoners, to put all my books under ground. He did not do it. At that time they acknowledged my orders, that is why I say so. He did not put my books away in time and I am not sorry. I say I thank the learned lawyers for the Crown for having reserved so many things; and if, by the almighty power of God, I go free from this trial, I have such confidence in British fairness that all my papers will be returned me, at least the originals, and if copies are wanted I will be willing to give them. No one can say that the North-West was not suffering last year, particularly the Saskatchewan, for the other parts of the North-West I cannot say so much; but what I have done, and risked, and to which I have exposed myself, rested certainly on the conviction, I had to do, was called upon to do something for my country. It is true, gentlemen, I believed for years I had a mission, and when I speak of a mission you will understand me not as trying to play the roll of insane before the grand jury so as to have a verdict of acquittal upon that ground. I believe that I have a mission, I believe I had a mission at this very time. What encourages me to speak to you with more confidence in all the imperfections of my English way of speaking, it is that I have yet and still that mission, and with the help of God, who is in this box with me, and He is on the side of my lawyers, even with the honourable court, the Crown and the jury, to help me, and to prove by the extraordinary help that there is a Providence to-day in my trial, as there was a Providence in the battles of the Saskatchewan. I have not assumed to myself that I had a mission. I was working in Manitoba first, and I did all I could to get free institutions for Manitoba; they have those institutions to-day in Manitoba, and they try to improve them, while myself, who obtained them, I am forgotten as if I was dead. But after I had obtained, with the help of others, a constitution for Manitoba, when the Government at Ottawa was not willing to inaugurate it at the proper time, I have worked till the inauguration should take place, and that is why I have been banished for five years. I had to rest five years, I was willing to do it. I protested, I said: 'Oh, my God, I offer You all my existence for that cause, and please to make of my weakness an instrument to help men in my country.' And seeing my intentions, the late Archbishop Bourget said: 'Riel has no narrow views, he is a man to accomplish great things,' and he wrote that letter of which I hope that the Crown has at least a copy. And in another letter, when I became what doctors believed to be insane, Bishop Bourget wrote again and said: 'Be ye blessed by God and man and take patience in your evils.' Am I not taking patience? Will I be blessed by man as I have been by God? I say that I have been blessed by God, and I hope that you will not take that as a presumptuous assertion. It has been a great success for me to come through all the dangers I have in that fifteen years. If I have not succeeded in wearing a fine coat myself I have at the same time the great consolation of seeing that God has maintained my view; that He has maintained my health sufficiently to go through the world, and that he has kept me from bullets, when bullets marked my hat. I am blessed by God. It is this trial that is going to show that I am going to be blessed by man during my existence, the benedictions are a guarantee that I was not wrong when by circumstances I was taken away from adopted land to my native land. When I see British people sitting in the court to try me, remembering that the English people are proud of that word 'fair-play', I am confident that I will be blesssed by God and by man also. Not only Bishop Bourget spoke to me in that way, but Father Jean Baptiste Bruno, the priest of Worcester, who was my director of conscience, said to me: 'Riel, God has put an object into your hands, the cause of the triumph of religion in the world, take care, you will succeed when most believe you have lost.' I have got those words in my heart, those words of J. B. Bruno and the late Archbishop Bourget. But last year, while I was yet in Montana, and while I was passing before the Catholic church, the priest, the Reverend Father Frederick Ebeville, curate of the church of the Immaculate Conception, at Benton, said to me: 'I am glad to see you; is your family here?' I said: 'Yes.' He said: 'Go and bring them to the altar, I want to bless you before you go away.' And with Gabriel Dumont and my family we all went on our knees at the altar, the priest put on his surplice and he took holy water and was going to bless us, I said: 'Will you allow me to pronounce a prayer while you bless me?' He said: 'Yes, I want to know what it is.' I told him the prayer. It is speaking to God: 'My Father, bless me according to the views of Thy Providence which are bountiful and without measure.' He said to me: 'You can say that prayer while I bless you.' Well, he blessed me and I pronounced that prayer for myself, for my wife, for my children, and for Gabriel Dumont. When the glorious General Middleton fired on us during three days, and on our families, and when shells went and bullets went as thick as mosquitoes in the hot days of summer, when I saw my children, my wife, myself and Gabriel Dumont were escaping, I said that nothing but the blessing without measure of Father Frederick Ebeville could save me, and that can save me to-day from these charges. The benediction promised to me surrounded me all the time in the Saskatchewan, and since it seems to me that I have seen it. Captain Deane, Corporal Prickert, and the corporal of the guard who have been appointed over me have been so gentle while the papers were raging against me shows that nothing but the benediction of God could give me the favor I have had in remaining so respected among these men. To-day when I saw the glorious General Middleton bearing testimony that he thought I was not insane, and when Captain Young proved that I am not insane, I felt that God was blessing me, and blotting away from my name the blot resting upon my reputation on account of having been in the lunatic asylum of my good friend Dr Roy. I have been in an asylum, but I thank the lawyers for the Crown who destroyed the testimony of my good friend Dr Roy, because I have always believed that I was put in the asylum without reason. To-day my pretension is guaranteed, and that is a blessing too in that way. I have also been in the lunatic asylum at Longue Pointe, and I wonder that my friend Dr Lachapelle, who took care of me charitably, and Dr Howard are not here. I was there perhaps under my own name. Even if I was going to be sentenced by you, gentlemen of the jury, I have this satisfaction if I die - that if I die I will not be reputed by all men as insane, as a lunatic. A good deal has been said by the two reverend fathers, Andre and Fourmand. I cannot call them my friends, but they made no false testimony. I know that a long time ago they believed me more or less insane. Father Fourmand said that I would pass from great passion to great calmness. That shows great control under contradiction, and according to my opinion and with the help of God I have that control. Mr. Charles Nolin, when he went into the box, did not say that he was sworn with me in all the affairs that I did. Far from taking them as insane affairs, he was in them under the cover of an oath with four of us. He did not say that in the box. My word is perhaps not testimony, but if he was asked in the box to say if there was an oath taken he could not deny it, and he would have to name the four men, and he would have to name himself. When he speaks of resigning a contract in my favor, I did not ask it, the Government would not give it to me; besides, he was engaged in a movement against the Government, and to take a contract from the Government was certainly a weakness upon his part, and I told him not to compromise his cause, and I told him to withdraw instead of going ahead till we saw if we were going to be listened to at all. He wanted me to make a bargain and renounce my American citizenship. I told him that it was a matter of more strength that I should be an American citizen, not that I want to make any ground of it, but as it took place naturally and as the fact existed I wanted to take advantage of it as such. I told him: 'It is of advantage for you that you should have me an American citizen. I have no bargain to make with you about my American papers, no bargain on such a matter as that.' Mr. Charles Nolin speaks of my ambition, and other witnesses also. There are men among the prisoners who know that last year Mr. Renez and Mr. Joseph Fourget came to the Saskatchewan and said that I could have a place in the council if I wanted it, and that it was a good chance for the half-breeds of the Saskatchewan. If I had been so anxious for position I would have grasped at this place, but I did not, and Mr. Nolin has some knowledge of that. I speak of those things to defend my character, as it has been said that I am egotistical. The agitation in the North-West Territories would have been constitutional, and would certainly be constitutional to-day if, in my opinion, we had not been attacked. Perhaps the Crown has not been able to find out the particulars, that we were attacked, but as we were on the scene it was easy to understand. When we sent petitions to the Government, they used to answer us by sending police, and when the rumours were increasing every day that Riel had been shot here or there, or that Riel was going to be shot by such and such a man, the police would not pay any attention to it. I am glad that I have mentioned the police, because of the testimony that has been given in the box during the examination of many of the witnesses. If I had been allowed to put questions to the witnesses, I would have asked them when it was I said a single word against a single policeman or a single officer. I have respected the policemen, and I do today, and I have respected the officers of the police; the paper that I sent to Major Crozier is a proof it: 'We respect you, Major.' There are papers which the Crown has in its hands, and which show that demoralization exists among the police, if you will allow me to say it in the court, as I have said it in writing. 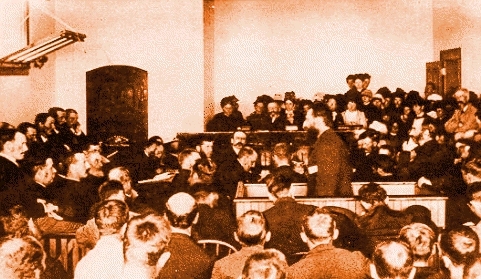 Your Honours, gentlemen of the jury: If I was a man of today perhaps it would be presumptuous to speak in that way, but the truth is good to say, and it is said in a proper manner, and it is without any presumption, it is not because I have been libeled for fifteen years that I do not believe myself something. I know that through the grace of God I am the founder of Manitoba. I know that though I have no open road for my influence, I have big influence, concentrated as a big amount of vapour in an engine. I believe by what I suffered for fifteen years, by what I have done for Manitoba and the people of the North-West, that my words are worth something. If I give offence, I do not speak to insult. Yes, you are the pioneers of civilization, the whites are the pioneers of civilization, but they bring among the Indians demoralization. Do not be offended, ladies, do not be offended, here are the men who can cure that evil; and if at times I have been strong against my true friends and fathers, the reverend priests of the Saskatchewan, it is because my convictions are strong. There have been witnesses to show that immediately after great passion I could come back to the great respect I have for them. One of the witnesses here, George Ness, I think, said that I spoke of Archbishop Tache, and told him that he was a thief. If I had had the opportunity I proposed I would have questioned him as to what I said, so that you would understand me. I have known Archbishop Tache as a great benefactor, I have seen him surrounded by his great property, the property of a widow, whose road was passing near. He bought the land around, and took that way to try and get her property at a cheap price. I read in the Gospel: 'Ye Pharisees with your long prayers devour the widows.' And as Archbishop Tache is my great benefactor, as he is my father, I would say because he has done me an immense deal of good, and because there was no one who had the courage to tell him, I did, because I love him, because I acknowledge all he has done for me; as to Bishop Grandin, it was on the same grounds. I have other instances of Bishop Tache, and the witness could have said that the Reverend Father Moulin: 'When you speak of such persons as Archbishop Tache, you ought to say that he made a mistake, not that he committed robbery.' I say that we have been patient a long time, and when we see that mild words only serve as covers for great ones to do wrong, it is time when we are justified in saying that robbery is robbery everywhere, and the guilty ones are bound by the force of public opinion to take notice of it. The one who has the courage to speak out in that way, instead of being an outrageous man, becomes in fact a benefactor to those men themselves, and to society. When we got to the church of St Anthony on the 18th, there was a witness who said, I think George Ness, that I said to Father Moulin, 'You are a Protestant.' According to my theory I was not going to speak in that way, but I said that we were protesting against the Canadian Government, and that he was protesting against us, and that we were two protestants in our different ways. As to religion, what is my belief? What is my insanity about that? My insanity, your Honours, gentlemen of the jury, is that I wish to leave Rome aside, inasmuch as it is the cause of division between Catholics and Protestants. I did not wish to force my views, because in Batoche to the half-breeds that followed me I used the word, carte blanche. If I have any influence in the new world it is to help in that way and even if it takes 200 years to become practical, then after my death that will bring out practical results, and then my children's children will shake hands with the Protestants of the new world in a friendly manner. I do not wish these evils which exist in Europe to be continued, as much as I can influence it, among the half-breeds. I do not wish that to be repeated in America. That work is not the work of some days or some years, it is the work of hundreds of years. My condition is helpless, so helpless that my good lawyers, and they have done it by conviction (Mr. Fitzpatrick in his beautiful speech has proved he believed I was insane) my condition seems to be so helpless that they have recourse to try and prove insanity to try and save me in that way. If I am insane, of course I don't know it, it is a property of insanity to be unable to know it. But what is the kind of mission that I have? Practical results. It is said that I had myself acknowledged as a prophet by the half-breeds. The half-breeds have some intelligence. Captain Young who has been so polite and gentle during the time I was under his care, said that what was done at Batoche, from a military point of view was nice, that the line of defense was nice, that showed some intelligence. It is not to be supposed that the half-breeds acknowledged me as a prophet if they had not seen that I could see something into the future. If I am blessed without measure I can see something into the future, we all see into the future more or less. As what kind of a prophet would I come, would it be a prophet who would all the time have a stick in his hand, and threatening, a prophet of evil? If the half-breeds had acknowledged me as a prophet, if on the other side priests come and say that I am polite, if there are general officers, good men, come into this box and prove that I am polite, prove that I am decent in my manner, in combining all together you have a decent prophet. An insane man cannot withhold his insanity, if I am insane my heart will tell what is in me. Last night while I was taking exercise the spirit who guides and assists me and consoles me, told me that to-morrow somebody will come t'aider, five English and one French word t'aider, that is to help you. I am consoled by that. While I was recurring to my God, to our God, I said, but woe to me if you do not help me, and these words came to me in the morning, in the morning someone will come t'aider, that is to-day. I said that to my two guards and you can go for the two guards. I told them that if the spirit that directs me is the spirit of truth it is to-day that I expect help. This morning the good doctor who has care of me came to me and said you will speak to-day before the court. I thought I would not be allowed to speak; those words were given to me to tell me that I would have liberty to speak. There was one French word in it, it meant I believe that there was to be some French influence in it, but the most part English. It is true that my good lawyers from the Province of Quebec have given me good advice. Mr. Nolin came into the box and said that Mr. Riel said that he had a noise in his bowels and that I told him that it meant something. I wish that he had said what I said, what I wrote on the paper of which he speaks, perhaps he can yet be put in the box. I said to Nolin, 'Do you hear?' Yes, I said there will be trouble in the North-West, and was it so or not? Has there been no trouble in the North-West? Besides Nolin knows that among his nationality, which is mine, he knows that the half-breeds as hunters can fortell many things, perhaps some of you have a special knowledge of it. I have seen half-breeds who say, my hand is shaking, this part of my hand is shaking you will see such a thing to-day, and it happens. Others will say I feel the flesh on my leg move in such a way, it is a sign of such a thing, and it happens. There are men who know that I speak right. If the witness spoke of that fact which he mentioned, to show that I was insane he did not remember that perhaps on that point he is insane himself, because the half-breed by the movement of the hand, sometimes of his shoulders, sometimes his legs, can have certain knowledge of what will happen. To bring Sir John to my feet, if it was well reported it would appear far more reasonable than it has been made to appear; Mr. Blake the leader of the Opposition is trying to bring Sir John to his feet in one way. He never had as much at stake as I had, although the Province of Ontario is great it is not as great as the North-West. I am glad that the Crown have proved that I am the leader of the half-breeds in the North-West. I will perhaps be one day acknowledged as more than a leader of the half-breeds, and if I am I will have an opportunity of being acknowledged as a leader of good in this great country. One of the witnesses said that I intended to give Upper Canada to the Irish, if he had no mystery he would have seen that Upper Canada could not be given to the Irish without being given to England; he rested only upon his imagination. There is another thing about the partition of lands into sevenths. I do not know if I am prepared to speak of it here because it would become public information, there is so much at stake that if I explained that theory Canada would not very long remain in quiet. Captain Deane has seen my papers, I have sent them somewhere but he has seen them, and after seeing them he came there and said that I was an intelligent man, and pretty shrewd. I have written these documents and they are in the hands of those whom I trust. I do not want to make them public during my trial; what I have made public during the sixty days we were in arms at Batoche. There have been three different times when the council decided to send men to the States to notify the nationalities to come to our assistance, but these three delegations waited for my orders and have not started; why? Because I had an object. The half-breeds also knew that I told them that they would be punished, that I did not say it of my own responsibility, but that I said it in the same way as I have told them other things. It was said to me that the nation would be punished. Why? Because she had consented to leave Rome too quick. What was the meaning of that? There was a discussion about too quick; they said that they should do it at once. Too quick does not mean too soon, if we say yes, it shows no consideration to the man. If God wants something, and if we say yes, that is not the way to answer him. He wants the conscience to say: yes, oh my God, I do Thy will; and because the half-breeds quickly separated from Rome, in such a quick manner, it was disagreeable to God and they were punished, and I told them it would happen; fifty of those who are there can prove it. But, you will say, you did not put yourself as a prophet? The 9th century is to be treated in certain ways, and it is probably for that reason I have found the word 'exovede,' I prefer to be called one of the flock; I am no more than you are, I am simply one of the flock, equal to the rest. If it is any satisfaction to the doctors to know what kind of insanity I have, if they are going to call my pretensions insanity, I say humbly, through the grace of God, I believe I am the prophet of the new world. I wish you to believe that I am not trying to play insanity, there is in the manner, in the standing of a man, the proof that he is sincere, not playing. You will say, what have you got to say? I have to attend to practical results. Is it practical that you be acknowledged as a prophet? It is practical to say it. I think that if the half-breeds have acknowledged me, as a community, to be a prophet, I have reason to believe that it is beginning to become practical. I do not wish, for my satisfaction, the name of prophet, generally that title is accompanied with such a burden, that if there is satisfaction for your vanity, there is a check to it. To set myself up as Pope, no, no. I said I believed that Bishop Bourget had succeeded in spirit and in truth. Why? Because while Rome did not pay attention to us, he, as a bishop, paid attention to us. You have given me your attention, your Honours; you have given me your attention, gentlemen of the jury, and this great audience, I see that if I go any further on that point I will lose the favor you have granted me up to this time, and as I am aiming all the time at practical results, I will stop here, master of myself, through the help of God. I have only a few more words to say, your Honours. Gentlemen of the jury, my reputation, my liberty, my life, are at your discretion. So confident am I, that I have not the slightest anxiety, not even the slightest doubt, as to your verdict. The calmness of my mind concerning the favorable decision which I expect, does not come from any unjustifiable presumption upon my part. I simply trust, that through God's help, you will balance everything in a conscientious manner, and that, having heard what I had to say, that you will acquit me. I do respect you, although you are only half a jury, but your number of six does not prevent you from being just and conscientious; your number of six does not prevent me giving you my confidence, which I would grant to another six men. Your Honour, because you appointed these men, do not believe that I disrespect you. It is not by your own choice, you were authorized by those above you, by the authorities in the North-West; you have acted according to your duty, and while it is, in our view, against the guarantees of liberty, I trust the Providence of God will bring out good of what you have done conscientiously. Although this court has been in existence for the last fifteen years, I thought I had a right to be tried in another court. I do not disrespect this court. I do respect it, and what is called by my learned and good lawyers, the incompetency of the court must not be called in disrespect, because I have all respect. 1st That the House of Commons, Senate and Ministers of the Dominion, and who make laws for this land and govern it, are no representation whatever of the people of the North-West. 2nd That the North-West Council generated by the Federal Government has the great defect of its parent. 3rd The number of members elected for the Council by the people make it only a sham representative legislature and no representative government at all. British civilization which rules today the world, and the British constitution has defined such government as this is which rules the North-West Territories as irresponsible government, which plainly means that there is no responsibility, and by all the science which has been shown here yesterday you are compelled to admit if there is no responsibility, it is insane. Good sense combined with scientific theories lead to the same conclusion. By the testimony laid before you during my trial witnesses on both sides made it certain that petition after petition had been sent to the Federal Government, and so irresponsible is that Government to the North-West that in the course of several years besides doing nothing to satisfy the people of this great land, it has even hardly been able to answer once or to give a single response. That fact would indicate an absolute lack of responsibility, and therefore insanity complicated with paralysis. The Ministers of an insane and irresponsible Government and its little one - the North-West Council - made up their minds to answer my petitions by surrounding me slyly and by attempting to jump upon me suddenly and upon my people in the Saskatchewan. Happily when they appeared and showed their teeth to devour, I was ready: that is what is called my crime of high treason, and to which they hold me to-day. Oh, my good jurors, in the name of Jesus Christ, the only one who can save and help me, they have tried to tear me to pieces. If you take the plea of the defense that I am not responsible for my acts, acquit me completely since I have been quarrelling with an insane and irresponsible Government. If you pronounce in favor of the Crown, which contends that I am responsible, acquit me all the same. You are perfectly justified in declaring that having my reason and sound mind, I have acted reasonably and in self-defense, while the Government, my accuser, being irresponsible, and consequently insane, cannot but have acted wrong, and if high treason there is it must be on its side and not on my part. HIS HONOUR: Are you done? RIEL: Not yet, if you have the kindness to permit me your attention for a while. RIEL: For fifteen years I have been neglecting myself. Even one of the most hard witnesses on me said that with all my vanity, I never was particular to my clothing; yes, because I never had much to buy any clothing. The Rev. Father Andre has often had the kindness to feed my family with a sack of flour, and Father Fourmand. My wife and children are without means, while I am working more than any representative in the North-West. Although I am simply a guest of this country - a guest of the half-breeds of the Saskatchewan - although as a simple guest, I worked to better the condition of the people of the Saskatchewan at the risk of my life, to better the condition of the people of the Saskatchewan at the risk of my life, to better the condition of the people of the North-West, I have never had any pay. It has always been my hope to have a fair living one day. It will be for you to pronounce - if you say I was right, you can conscientiously acquit me, as I hope through the help of God you will. You will console those who have been fifteen years around me only partaking in my sufferings. What you will do in justice to me, in justice to my family, in justice to my friends, in justice to the North-West, will be rendered a hundred times to you in this world, and to use a sacred expression, life everlasting in the other. I thank your Honour for the favour you have granted me in speaking; I thank you for the attention you have given me, gentlemen of the jury, and I thank those who have had the kindness to encourage my imperfect way of speaking the English language by your good attention. I put my speech under the protection of my God, my Saviour, He is the only one who can make it effective. It is possible it should become effective, as it is proposed to good men, to good people, and to good ladies also.